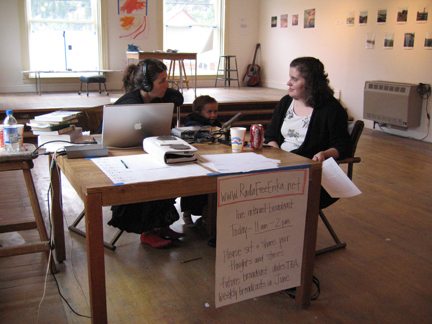 Program 1 - Live from the Montana Artist's Refuge Annual Jazz Brunch Benefit. Conversations with brunch attendees, former artist's in residence, Montana residents, Dove shares about his trip and two readings by MAR artist in residence Susan Rushing Adams. Susan Rushing Adams, author with Erika and Dove live on the air during open studios. Listen to the full Program 1 - June 11, 2006 broadcast (approx. 3hrs.) here. Program 2 - First solo broadcast. Yodeling galore, the perfection of a moment, swallows and sparrows, rainy day fishing, the guns section of the sporting goods store, library cards, fever spots, 35 questions and the definitions of dumb. 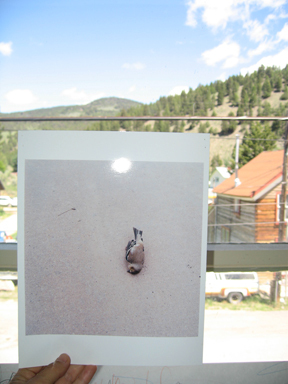 Studio View and photo of dead bird, June 16, 2006. Listen to the full Program 2 - June 15, 2006 broadcast (approx. 2hrs.) here. Special Archived off air interview (approx. 30mins.) Friday June 16, with Claudia Montagne, MAR executive Director. 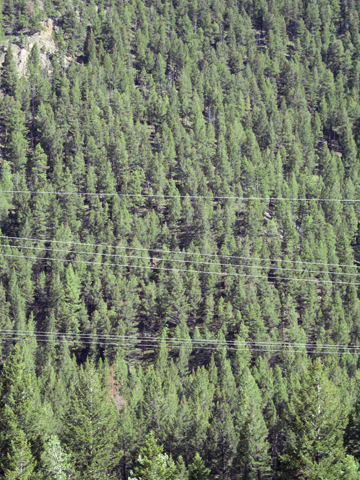 Elkhorn Mountains and electrical wires. Listen to the full Program 3 - June 22, broadcast (approx. 2hrs 20min) here. Program 4 - a super skipping yodeling track (a thrift score) and a Hawaiian Cowboy Song. Conversations with basin residents; Liz Kelly, owner operator of the local rummage shop and administrator at The Merry Widow Health Mines, and Bryher Hercek,owner operator of The High Note Cafe and venue. 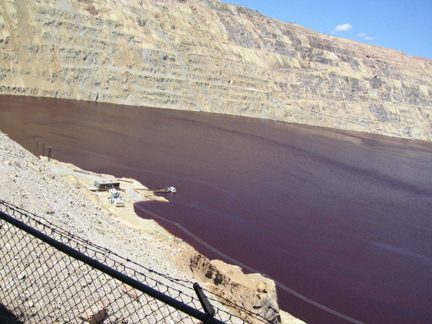 Topics covered include, thrift shopping, radon health treatments, The Berkely Pit in Butte, Montana politics, Cafe running, living without gas-electricity-running water, strip malls and moose sightings. Listen to the full Program 4 - June 27, 2006 (approx. 2hrs) here.